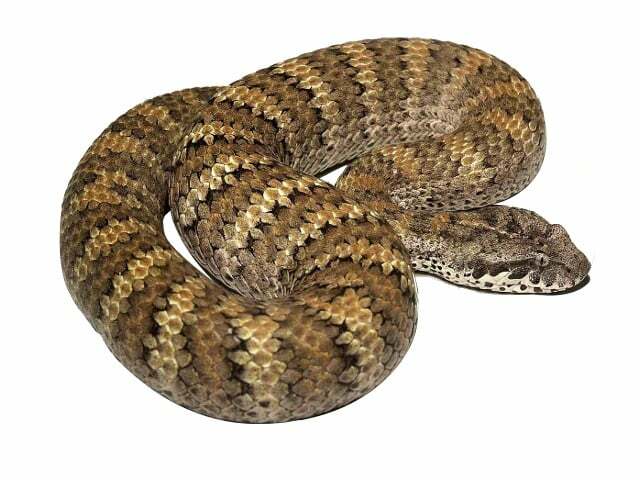 Acanthophis antarcticus also known as southern death adder has a broad flattened, triangular head and a thick body with bands of red, brown and black with a grey, cream or pink belly. Death adders possess the longest fangs of any Australian snake. Acanthophis antarcticus venom contains highly toxic neurotoxin which can cause paralysis or even death. It can deliver the fastest strike among all venomous snakes recorded in Australia. Human death can occur within six hours after the bite. An adult breeding trio of 1 male & 2 females can be maintained in an all glass terrarium for all round viewing with minimum dimensions of around 1.2 meters wide, 0.6 meters deep & 0.5 meters high (4 x 2 x 1.6 feet) with a 2 piece L & R top sliding lockable access, with a wire mesh air vent in the top 2 back corners. Or a cabinet style with front glass only. Babies can be ideally kept in Chinese containers with air holes drilled across the top only. Once they are 1 & 1/2 times the length of their container, the container should then be upsized. It’s better to grow them up individually to avoid cannibalism. No hide boxes are provided for death Adders. They shovel their uniquely designed heads into the substrate provided to hide. With different keeper’s comes different substrate choices. It ranges from dull flat newspaper, recycled pelleted newspaper, sand, mulches, leaves, & small twigs & branches. Their maintained on a little bit of eucalyptus mulch & sand at the bottom to absorb moisture. It’s a more natural captive environment to live in. Babies are raised up within Chinese food containers on viva kitchen paper towels. One square folded over fits well. This is replaced after feeding intervals of 1 to 3 weeks. Some small ones are raised collectively to save space in larger tubs, where they can spread out, & not stress out on dried eucalyptus mulch with a little sand at the bottom for moisture absorption. All my adults have access to 1× 60 watt spot light globe. Its positioned at one end about 0.25 meters (0.8 feet) above a wide rock slab which also heats up. This light is timed to the sun & season. All my lights are about 0.2 to 0.25 meters (0.6 to 0.8 feet) roughly off the ground. At the other end under the mulch is a heat pad that’s also timed to the season. Under the 60 watt spotlight globe the temperature is ranging between 40-48 °C (104-118 ºF). Air temperature is 25 °C (77 ºF) there & 23 °C (73 ºF)at the far end. Room temperature in winter is around 22 °C (71 ºF) it may vary 4 °C (6 ºF) up or down in mid winter “July”. In summer room temperature may exceed 30 °C (86 °F), then all heating is switched off. The snake house room temperature is also important its maintained not to drop below a low of 18 °C (65 °F) in winter at night. DA’S housed in the chinese tubs & next size up containers are placed on a heat pad. Only 1/3 of the base of the containers sit on the heat pad. The enclosures have 2 air vents at the top only & the containers have drilled holes also top only. Water bowls are always there with clean drinking water. 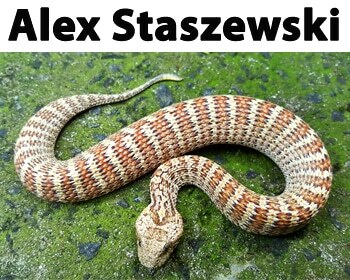 They vary in size from Gatorade caps for babies in Chinese containers to the 3 or 4″ ceramic reptile ones. I don’t go & provide any humidity for them. They are actually kept quite dry. The only humidity they might get is what’s in the air naturally. My DA’s are fed between 1 & 3 weeks. Babies get 1 to 2 day old pinky mice & the adults get adult mice to half sized rats. They also get chicken hatchies. Ones in individual enclosures are not supervised, but I always supervise the collectively housed ones till the very last one consumes its meal fully. To avoid accidental cannibalism over a meal. One of the easiest Australian elapids to handle & catch. Their simply hooked up mid-way ventrally & lifted up. Wild ones or cranky captives that thrash around sideways “left & right”, & wanna bite, are a little more challenging. Most captive born individuals will be used to getting picked up by a 6 to 8mm jigger. Myself I usually pick up adults at 2 points so they’re more comfortable. I hook adults 1/3 of their length back from the head with one hand & support the rear end in front of their cloaca with my other hand. Babies are hooked midway with a smaller 2 to 3mm jigger. My favorite adult DA jigger is about 3′ long. Scats are removed as soon as possible, with the removal of contaminated paper or mulch. Adult enclosure’s are totally stripped cleaned & remodelled yearly or earlier if need be. Most Death adder’s in good health don’t really have issues with incomplete or patchy sheds. Like all snakes though, if there is good humidity or water around they will use it to soften the skin for removal. After a shed just make sure its all off, particularly on their caudal lures, if left on there it can act as permanent tourniquet. Stopping growth & cutting off the blood supply. Hence then dying & dropping off. Like “most” snakes / It may take an hour or two. If there is some retained shed one of the most easiest ways to remove it is to put the snake into a glass or plastic temporary enclosure. Put some warm wet straw in it & then the snake will do the rest. It may take an hour or be left overnight in a warm room. The snake will have the perfect environment to remove all of the annoying skin simply by just moving & rubbing through all that wet straw. All species of Death Adders are “Very Hardy” in captivity. They don’t seem to have many problems at all if kept properly – “warm & dry”. However with every shed just check to make sure it’s complete & none retained anywhere but particularly on the lure.